Happy April Fool’s Day! I have always wanted to come up with some grand Fool’s Day scheme but sadly all my tricks revolve around food. Sugar in the salt shaker, salt in the sugar bowl. Nothing too creative or mind blowing to say the least. One year the Wild Boar, the kids and I happened to be in Mendocino on April Fool’s Day. We were staying in a Bed & Breakfast over looking the very cold, treacherous PacificOcean. We told the kids we were going to spend the day diving andattempting to catch a shark. Abalone season had just openedand divers were everywhere. The boys, to our surprise, were ecstatic. At this point, the youngest did not even know how to swim but he was totally fine with diving into the water to catch a giant, man-eating, killer shark. They cried. They were so mad. They wanted a shark and didn’t care what they had to do to get it. So needless to say, I’ll stick with food trickery. It’s less dramatic and far less disappointing when it doesn’t pan out. So when the kids came home from school Monday afternoon they saw these cupcakes on the counter. My oldest hooligan thought they were carrot cake cupcakes and immediately took a bite. 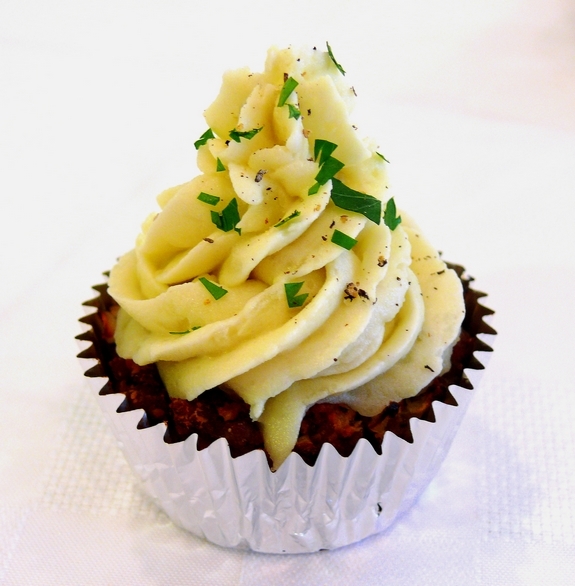 To his surprise, he bit into a Sausage Meatloaf Cupcake with Creamy Potato Frosting. This annoyed him but he laughed. I explained April Fool’s came a little early. The kids are always amazed when I trick them, they think they know everything and I am of course clueless. Anyway, these cupcakes are fun little ways to make the day special. These would also be perfect for Halloween. Since we spentpart of yesterday traveling, the kids had a full and exciting day and went to bed late. They have forgotten today is April Fool’s since they will not be in school. Of course, I have not forgotten. I am getting up early this morning and cooking a full dinner….for breakfast. The kids were so exhausted last night they will sleep a little late and when theyawake, I will tell they got up just in time for dinner. They unknowingly slept the whole day. I will also tell them they need to hurry up and eat because they have to shower and get ready for bed again! Ha! It’s the perfect plan. They will be so mad. I can’t wait to see their little faces as I serve up a pot roast, potatoes, carrots and salad. I’m cackling just thinking about it. It’s cooking on low in my oven as we speak. It will be ready at 7 AM. I am such a mean Mom. Here’s what you will need: Baking potatoes, Italian sausage, onion, bell pepper, heavy cream, butter, salt, plain breadcrumbs and eggs. 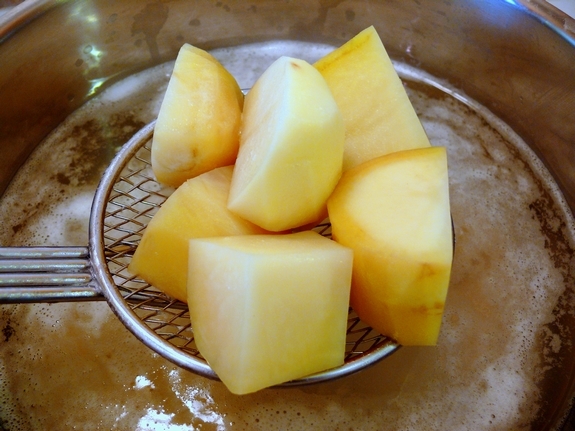 In a medium saucepan of salted water, bring the potatoes to a boil. Cook until tender, about 15 minutes, drain. Using an electric mixer, beat the potatoes with 1/2 cup heavy cream, 2 Tablespoons butter and 1/2 teaspoon salt until smooth. Keep warm and set aside. Meanwhile, in a large skillet, cook the 1-1/4 pounds sausage over medium-high heat, breaking up the meat, until barely pink, 3-4 minutes. Using a slotted spoon, transfer to a large bowl. Discard any excess grease and return to medium heat. 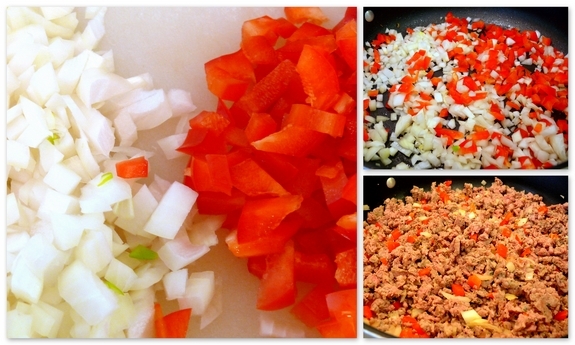 Add the onion and bell pepper and cook, stirring, until softened, about 4 minutes. Add to the sausage and let stand for 5 minutes. 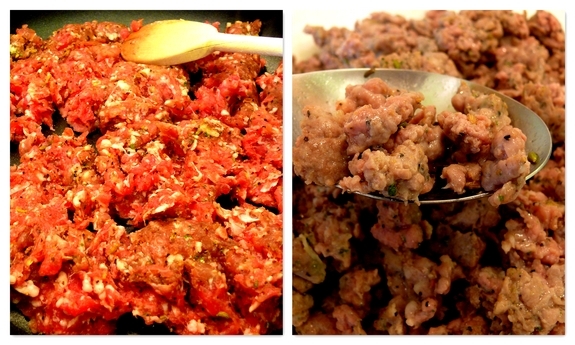 Using your hands combine 1-1/4 cups plain breadcrumbs, sausage mixture and 2 eggs, breaking up any large pieces. Season with salt. Fill each foil-lined muffin cup with sausage mixture (flat to the top). Bake until browned, about 20-30 minutes. Let cool for 10 minutes and transfer to a platter. 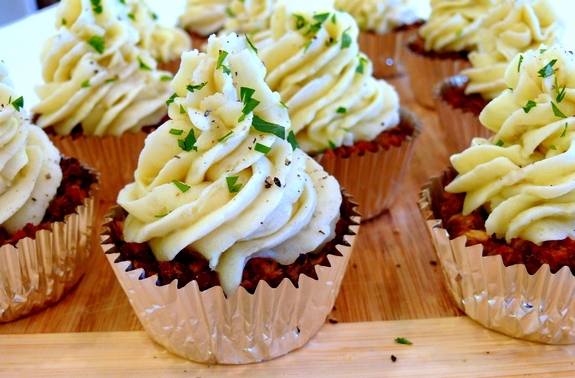 Fill a pastry bag fitted with a star tip (or resealable plastic bag with a corner cut off) with the mashed potatoes and pipe onto each cupcake. Garnish with some chopped parsley and freshly ground pepper. I’m sure you can trick someone with these. It sort of looks like cake with a cream cheese frosting? He-he…I hope you don’t get tricked! Using an electric mixer, beat the potatoes with heavy cream, butter and 1/2 teaspoon salt until smooth. Keep warm and set aside. Meanwhile, in a large skillet, cook the sausage over medium-high heat, breaking up the meat, until barely pink, 3-4 minutes. Using a slotted spoon, transfer to a large bowl. Discard any excess grease and return to medium heat. 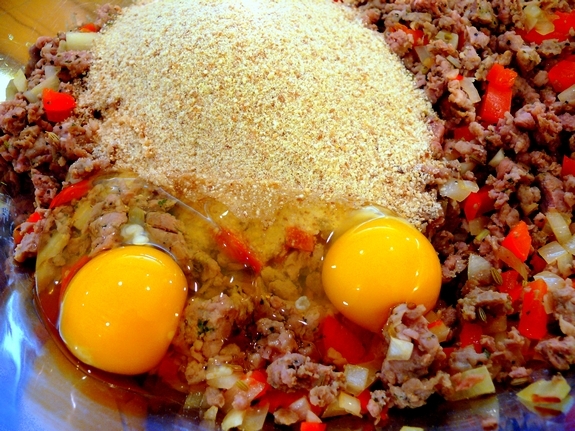 Using your hands combine breadcrumbs, sausage mixture and eggs, breaking up any large pieces. Season with salt. Garnish with chopped parsley and freshly ground pepper. Too funny! I need to be more creative. What a great idea ! You will tell us how the boys reacted to your joke won’t you? You are a total hero! I have to copy youridea for next year.. I only thought of toothpaste on tilet seat this morning.. LOVE the food ideas, you are the best! You are too funny!! I can’t wait to hear how your kids react to the pot roast. And these “cupcakes” would be an amazing trick for next year – going to have to stow this one away for then. Take two on this comment … I knew they were potatoes because you are a potato ho, Cathy! 😉 I’d like one right now please! I voted. Love that perfect spring recipe! My best April Fool’s joke was to swap out the inner lining of DH’s raisin bran with a sugary cereal (which he hates). So he poured out his cereal and got sugary cereal instead of raisin bran. He was quite confused in the early am, looking at the box to see what he’d done wrong. My son knows my intense hate of roaches, so he made Creepy Crawler (remember those?) roaches and put them in my cereal. I expected it because he hung around giggling waiting for me to eat my cereal. LOL They looked pretty convincing. Ugh. I am so glad I am reading this in the morning – I am pulling out my frozen sausage right now! What a treat – and a trick!!! Thanks! Cathy, you’ll have to keep us posted on how that turns out! And those “cupcakes” do look yummy. Brilliant idea! And they are not only cute and clever but they look delicious! Those look great, happy 4 – 1 day. How cool! Perfect for April Fools. The cupcakes look so delicious too! You fooled me for sure! What a great idea! You’ll have to let us know what the boys thought of your trickery. You are so funny! Opps I left my last comment in the wrong spot! These are so cute, I bet they taste great too. I didn’t realize you were in Davis, I live in the Bay Area. I love Davis, such a nice town. You are a tricky one! I love that about you! And yes… these look amazing! Hahaha! Great April Fools Day joke for today. I can’t wait to hear how they react! I can almost smell those heavenly things all the way here! What yummy looking “cupcakes!” Perfect for April Fools Day! They look yummy! Perfect April Foolers. I love that you play tricks on your kids for St. Patty’s and April Fools. 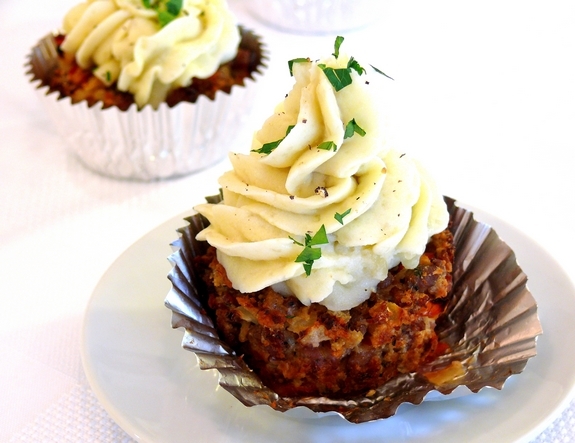 I love the meatloaf cupcakes – they look fun and tasty. HaHa!! Great trick! Those look awesome. What a clever idea. And, as always, wonderful photos! My 15 year old was too grumpy this morning for me to play an April Fools prank on him but I’m going to try to come up with a good one for when he gets home from school. So clever, Cathy. Kids of any age would like to be fooled by these cupcakes. What a terrific prank. Breakfast, lunch or dinner your boys will love them. You are hilarious! I only wish I was so clever. I wish Id seen this recipe earlier, so I could better prepare for April Fools. I will definitely have to try this one out next year. You don’t seem like a “mean mom” at all; you sound like a really fun, awesome mom! What a cute idea! I love this prank! You will tell us how it turns out, won’t you? The”cupcakes” look really good; in the picture, it does look like cream cheese frosting! I really thought these were cupcakes with cream cheese frosting! You will let us know how the joke works out, won’t you? wow, that trick is absolutely amazing! You got me dear! I am totally impress. They look so real and perfect ha..ha..ha.. 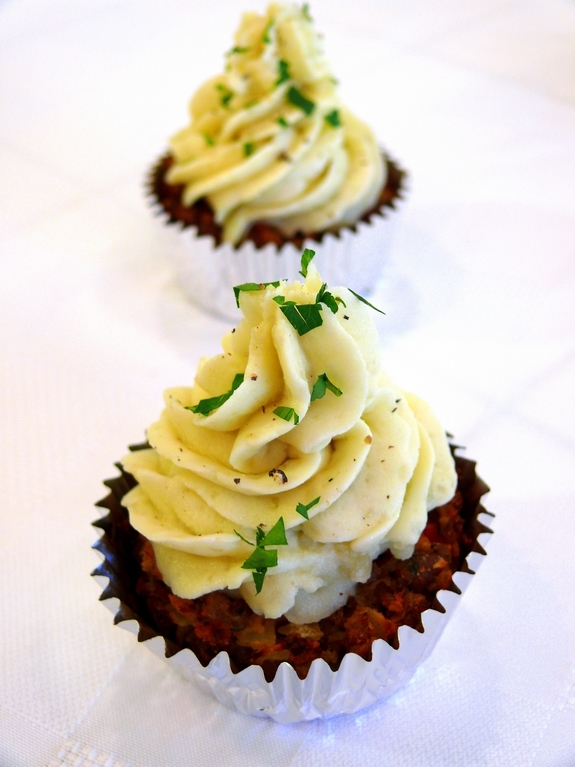 But, I probably prefer this meatloaf cupcakes then the real one. These rock! You are the greatest Mom and I can’t wait to hear about the pot roast. What a perfect trick! A meat cupcake? I’d be in heaven! They look great .. and I’m sure taste the same – as you say a cool idea for snacks or a picnic, as we’re coming into that season. Enjoy the breakfast roast .. I like your evil plan!! I’m lame this year–haven’t come up w/ a good trick for the kids–but the day is still young!! Well this is way better than the ketchup packets my son put under the toilet seat this morning. I had meatloaf on the menu for Friday, but I’ll do it tonight and try this. Love it! I haven’t come up with anything yet today. Everything I can come up with has been done before. People expect me to pull a stunt, year after year. So I think this year I’m giving them a break. Except…the Little Imp will see these, once I get the potatoes done (I came out earlier and read, before errands) and think her mumma rocks…cupcakes for dinner! Now to make sure the memory card is in the camera and the battery is charged! This is so original and adorable! I’ve never been ‘tricked’ into eating something like this but remember the sensation as a kid of picking up a cup of milk without looking and tasting tart, sweet orange juice instead, the surprise rendering the taste shocking and unpleasant. I’d think these adorable, ingenious meatloaf cupcakes are a much more enjoyable version of this surprise! Super cute. Now that’s the kind of trick I can get behind! Those look wicked good. i love the idea of the dinner-for-breakfast, oops-you-slept-the-whole-day joke you are going to play on your kids. Those cupcakes are such an awesome idea and I’m laughing hysterically at you tricking your sons. Be sure to let us know how it all went. Ha! We are on the same wave length with this one! Great looking cupcakes. Ooh they would be so mad at this one for sure! OKAY…those are awesome!!!! they sound good right now…I’m hungry! I love what you doing to your kids today…what a great idea!!!! I had preschool this morning and I had turned up side down the tables and the chairs were missing and their cubbies are all mixed up and we did the whole schedule backwards and the calendar said December…I â™¥ April Fools Day! You are awesome! I love dinner leftovers for breakfast. Can you be my mom?! So clever. Love the shark story. A blog friend of mine enlisted his children’s help to hide all of his wife’s right shoes. I love these!!! It’s one of the easiest ways to get the kids to eat meatloaf! Brilliant! 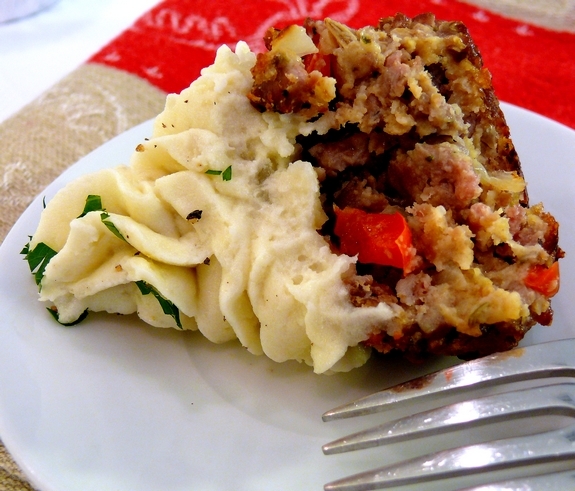 What a great way to serve meatloaf! You are quite the April Foolster! I totally would’ve bit into these cupcakes unassumingly. And what a surprise I would have had. This is hysterical! I also love the pranks you can play on kids while they’re still tired in the morning! Your April Fools trickery gives me something to aspire to… but the cupcakes look delicious! I love this idea! I have to make these. I short-sheeted my son’s bed. Oh Cathy you are wicked! Funny but wicked! 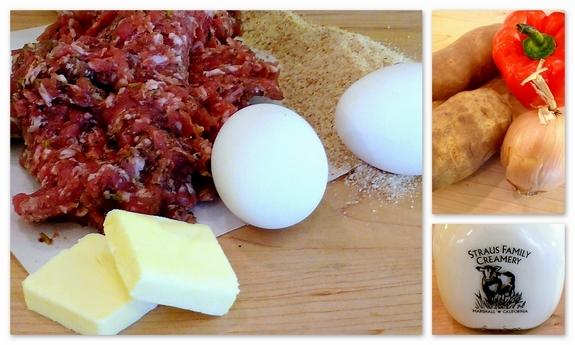 I made that recipe a few months ago, and liked it – perfect for April Fool’s Day. I think these food related April Fools jokes are the best. I was actually a bit nervous today whenever I remembered it was April Fools… I didn’t want anyone to play scary tricks on me. But these are just really fun/funny! This is RAD! I love the idea of a “meat” cupcake! Super cute and creative! I can’t wait to try this recipe! Just found your blog. Wow those are some kind of trickery! Everything looks delicious and I like the “freaky” eggs 🙂 He he. I’ll be back and can’t wait to see how the kids fared. dang, i wish i saw this sooner! these are brilliant ideas! i hope you tell us how it went… my joke was to tell everyone i was pregnant. shocked the hell out of my granny! A good trick to play! We’ll take a dozen. Love your Aprils fool plan almost as much as love these cupcakes. They are so pretty and you are so funny! I love your blog and go on everyday- I check it as obsessively as I do the celeb gossip sites! I have made the pumpkin cake with apple cider glaze many times, but this week I made it for my husband who is home on leave from Iraq. We literally ate almost the entire thing that night! 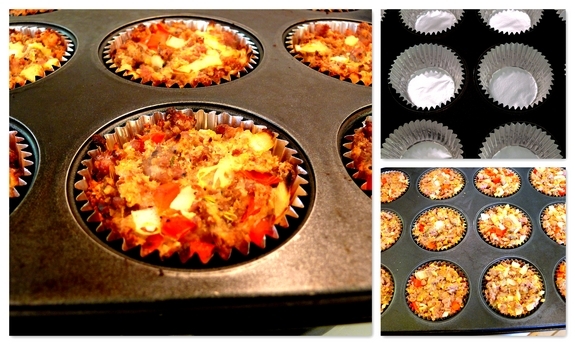 Last night, I made these cupcakes, but used ground turkey meat instead of sausage, and sweet potatoes instead of white. Let me tell you, you have to try it. My husband loved it! Thanks for all the great recipes and fun stories! Wow, I am very hungry now. Great article! Did you utilize a help of a essays online service for your superior release? I think that you really have great expository essay composing technique. Thank you for sharing this! If you are in uncomfortable position and have got no cash to move out from that, you will need to receive the loans. Because it would help you definitely. I get financial loan every time I need and feel myself good just because of it. You. Are a GENIUS. They look yummy, to boot. Have you ever made a pan of cornbread and then frosted it with chocolate icing. Great April Fool’s joke!! !